Atos, a global leader in digital transformation, today welcomed the news it has been recognised as one of the UK’s largest digital service providers in the Econsultancy top 100 digital agencies list. Atos UK & Ireland experienced strong double-digit growth in digital over the last two years with UK digital revenue in 2017 rising accordingly, leading to the company outperforming the market and helping it rise to third place on the Econsultancy list, up from fourth last year. 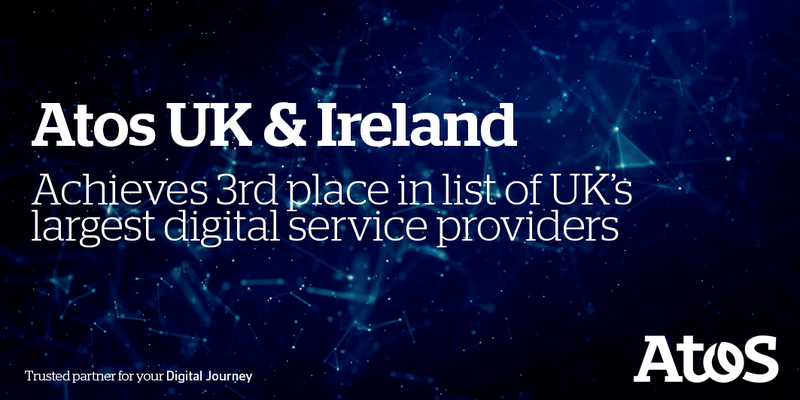 The position of Atos UK & Ireland this year highlights its specialist digital services and credentials as a leading digital transformation partner. This year, the company celebrated a number of significant milestones including a global partnership with Google Cloud1; delivering the world’s first Salesforce Einstein CRM at Ulster Bank2; and moving into new headquarters3 in London following a number of new client wins including Scottish Water4 and Aviva5. This is the latest in a line of industry endorsements for Atos in the digital transformation space which include being named a global leader in IoT6, Cognitive IT Infrastructure7, Big Data & Analytics Services8 and GDPR9 by NelsonHall, a leader in Managed Workplace Solutions10 by Gartner, and taking home gold at the Management Consulting Association Awards for its pioneering work to speed up lifesaving genome analysis times11. The breadth of digital transformation services from Atos includes digital, customer experience strategy, application transformation, cloud infrastructure, automation and AI, IoT, big data and analytics, SAP Hana, infrastructure and hosting, cyber security, digital payments and digital workplace solutions. These are delivered either as digital project services or as part of broader business transformation.